By: Amy Anderson of Mod Podge Rocks! Decoupage enthusiast Amy Anderson uses fabric to cover a wood storage box for keeping yarn. 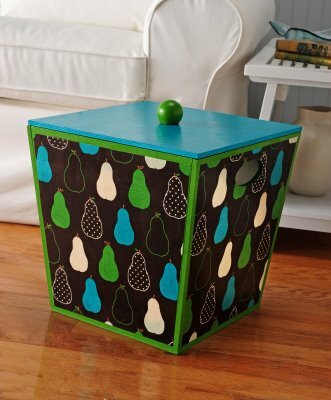 She coordinates the cute pear fabric with acrylic paint on the borders and top. Create your own storage box for yarn or anything else. This fabulous project makes a DIY box that is absolutely perfect for any room in your home. By learning how to make a box and decoupage craft idea, you can easily create a multi-use organizer. This smart, fabric-covered box comes with a top, meaning no matter how messy the clutter looks on the inside of this decoupage idea, the box will look neat and tidy so long as you have the top covered. It could even double as a small coffee table or end table. 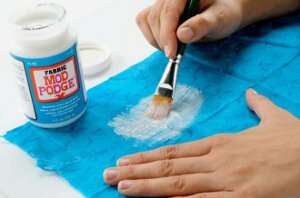 Find more mod podge ideas and how to tips in out informative and fun list of Mod Podge Basics + Mod Podge Ideas. While the fabric is drying, begin painting. Basecoat the inside of the bin and the lid with Teal. Allow to dry. Basecoat the outside of the bin and the wooden ball with Grass Green. Allow to dry. You are now going to cut the fabric. Lay the bin down on top of the fabric and trace one side four times. Cut these pieces out using the scissors. Measure approximately ½” inside your cut line on all four pieces and trim them down using the craft knife. Adhere these four pieces to the sides using the Gloss Mod Podge. Completely smooth out all air bubbles and allow to dry for 15 – 20 minutes. Coat the entire bin with at least two coats of Gloss Mod Podge. Coat the lid and the wooden ball as well. Allow to dry. Go back to the handles on the storage bin and trim the fabric out with a craft knife. Glue the wooden ball to the center top of the lid with the craft glue. Allow the storage bin to dry for at least 24 hours before using. I recommend spraying with several coats of acrylic sealer to completely finish your project and add durability. Wondering what other kinds of storage containers you can decorate with decoupage? Find out in our collection of 40+ Fabulous Decoupage Ideas Plus 3 Helpful Tutorials! This is such a cute storage craft! My best friend loves to knit, and she just leaves her expensive yarns all over the place. I'll have to make this for her for her birthday or Christmas. Cute little box. Does anyone shop the ooops paints at the big box hardware stores. The paints are usually inexpensive and can be mixed with paint you already have to create a custom color. I also buy the samples paints which are usually about a 8 oz instead of the more expensive craft paints, plus they can be mixed at the store match specific paint chips. I do. When I painted my office (also known as my craft room), I bought one of those samples and trimmed things with that. It was a lot less expensive than buying a pint and there was plenty for what I needed. I still have some left over. When I find white paint on sale, I buy it then I quite often mix my own paint for crafts like this. I like this one, because the box can be left out in the open as part of one's decor. This is a great project. I thought one extra thing that might be done is cut out a small hole for yarn to come through the top if you wanted to ever leave the yarn inside but it would still be availabel to use it. Kathy K.